I worked as a banker for 17 years, and now I am a freelance indexer. I love cooking tasty, healthy meals, and I also love staying fit. 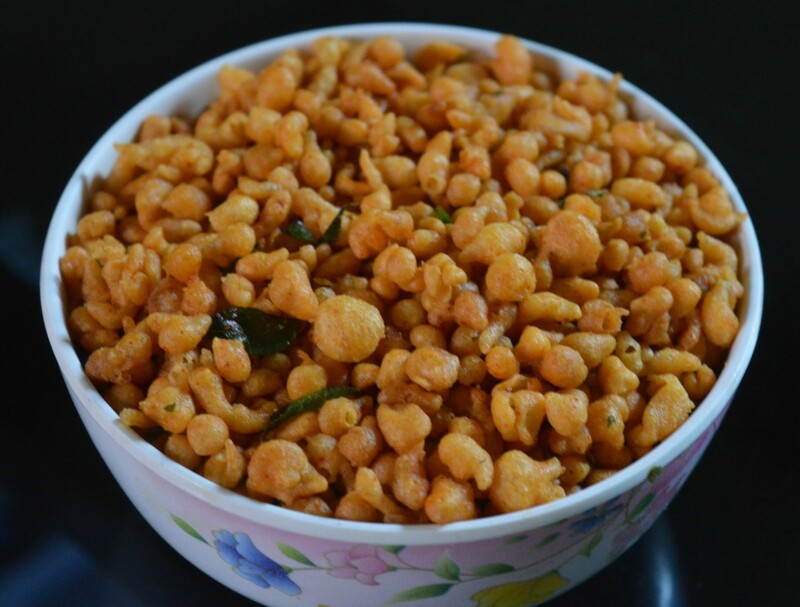 Start this recipe by soaking split bengal gram (chana dal) for about 3-4 hours in water. Strain them. Take half of soaked bengal gram, ginger, dry red chilies, green chilies, and grated or chopped coconut in a mixer grinder. Grind to get a near-smooth paste. No need to add water. The water in the lentils is enough for grinding. Now add the remaining bengal gram. Just pulse the contents once or twice. 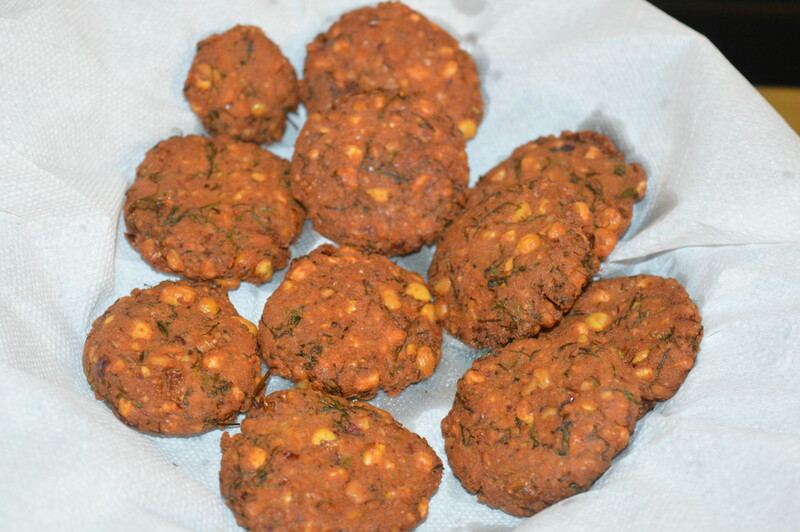 This is the perfect texture of grinding the lentils for making these vadas. Transfer the mix into a bowl. 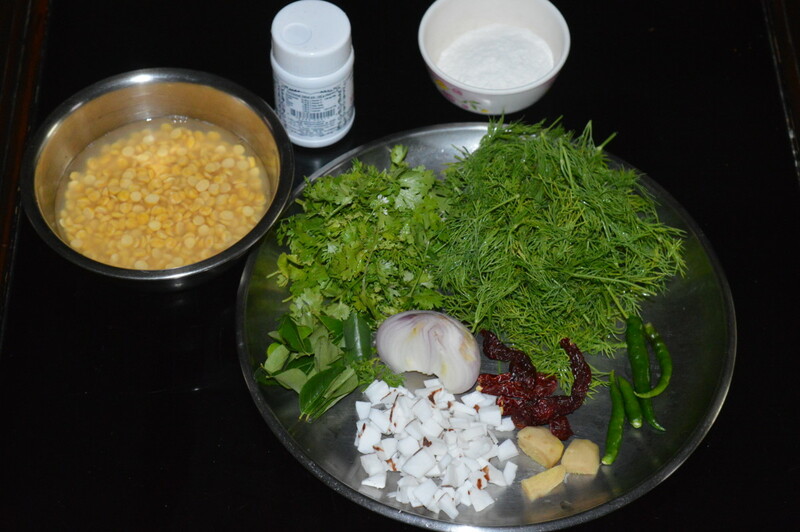 Add finely chopped dill leaves, coriander leaves, curry leaves, hing/asafoetida powder, rice flour, hot oil, and salt. Mix them together. Make lemon size balls out of them. Shape each of them like a patty. Arrange on a plate. Keep aside. Heat oil for deep frying. Drop these patties one by one into the hot oil. Don't over crowd them. Keep the fire medium-high in the initial stage of frying. Turn them often to ensure uniform frying on all sides. 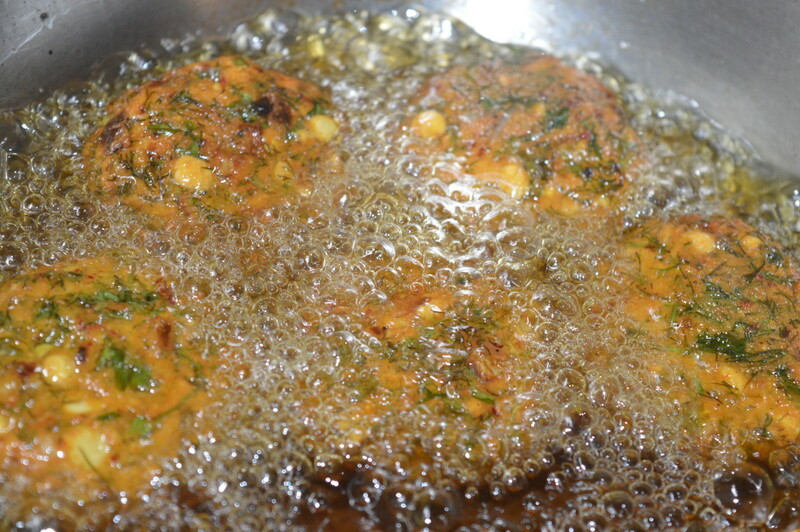 Reduce the fire a little, once these fritters become golden and crunchy on the outside. 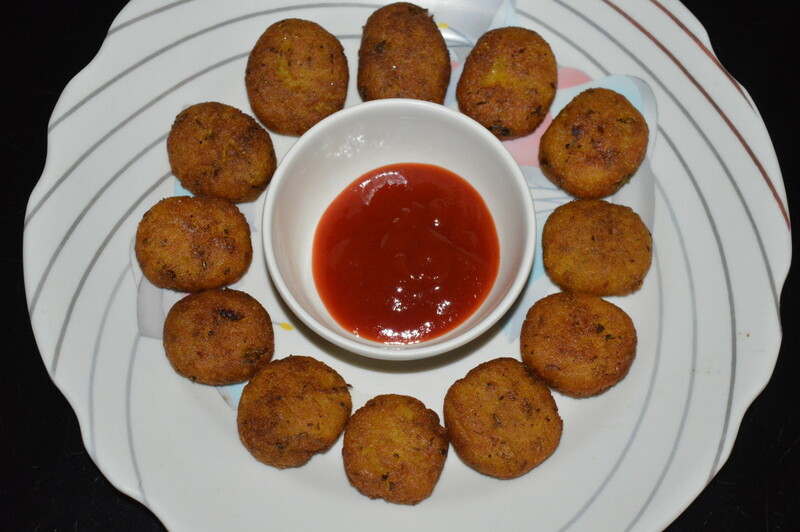 Fry them for a longer time to get proper crispy vadas. 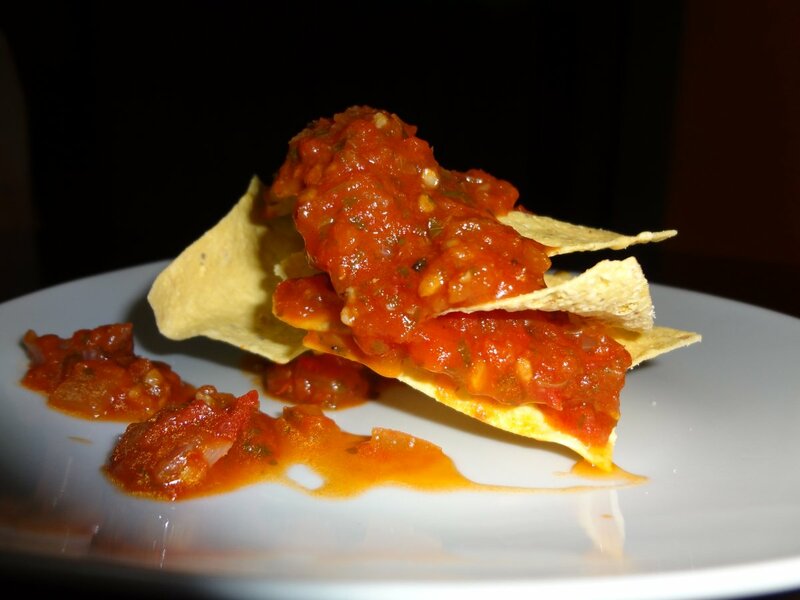 Take them out with a slotted ladle, and place on an absorbent paper towel. Repeat the same for making all the fritters. 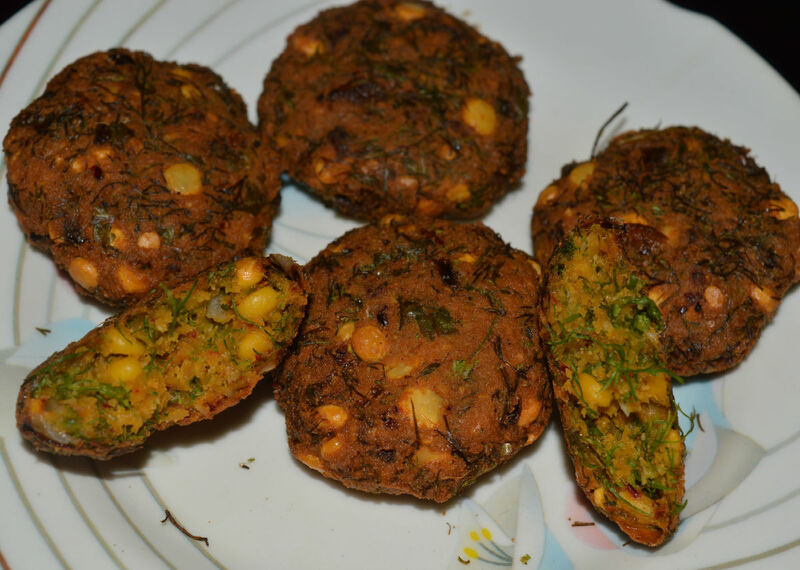 Serve these scrumptious vadas with a cup of hot coffee or tea. Enjoy! 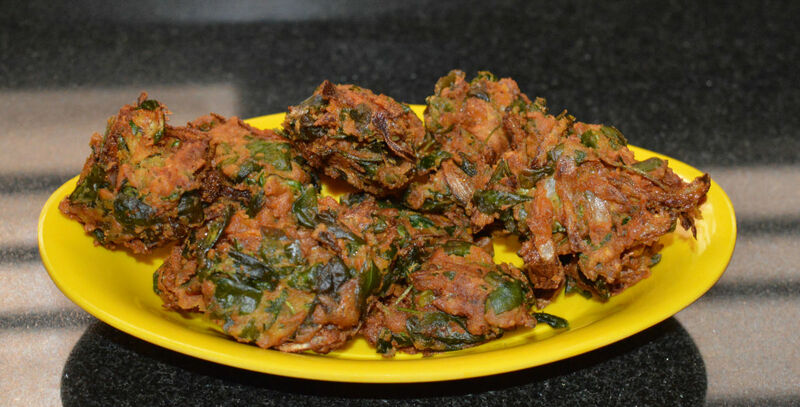 The more leafy greens you use, the darker your dal vada will be. For a lighter shade, use fewer leafy greens. Soak split bengal gram in water for 4 hours. Strain, and put half portion of them in a mixer/grinder. Keep the other half aside. Add green chilies, broken red chilies, ginger, chopped or grated coconut, and salt. Grind to get a thick near-smooth mix. No need to add water while grinding. The moisture in lentils is enough for grinding. Add the remaining soaked bengal gram into the mixer. Pulse once or twice. This is mainly to keep a few bengal gram as it is, and a few broken into half. Mix well. 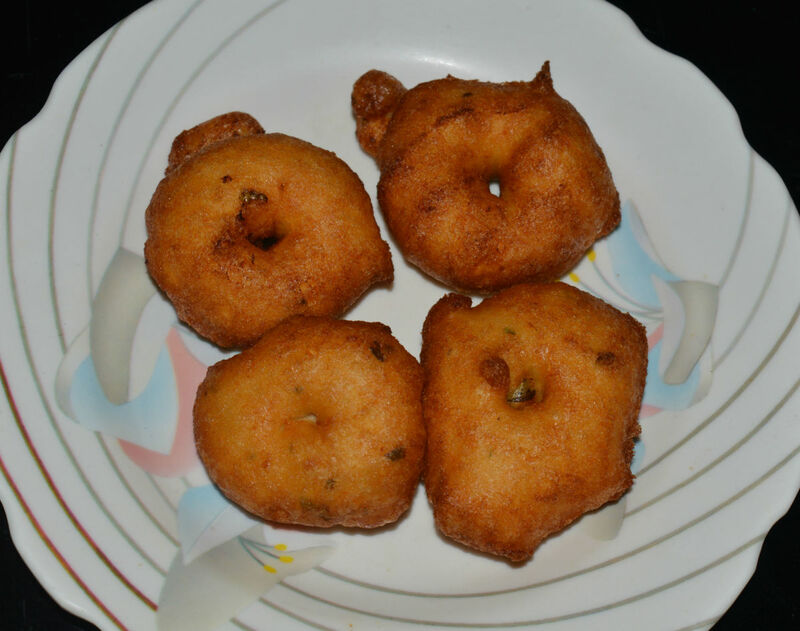 This is the consistency needed for making these vadas. Transfer the mix into a bowl. 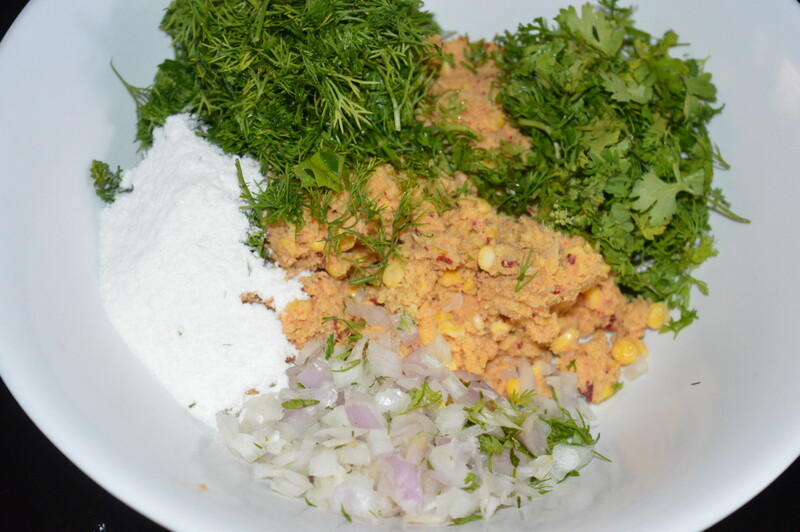 Add finely chopped dill leaves(optional), coriander leaves, curry leaves, hing/asafoetida powder, rice flour, chopped onions, and salt. Mix them. Pour a table spoon of very hot oil. Mix and blend. Divide the mix into many lemon-sized portions. Form patty shape from each of these portions. Arrange them on a plate. Heat oil for deep frying. Drop these patties one by one into the hot oil. Don't overcrowd them. Let the flame be high in the beginning. Once the fritters become golden, reduce the flame a little. Turn them often to ensure uniform cooking on all sides. Fry them for long time to ensure cooking till inside. This may take about 6-7 minutes. 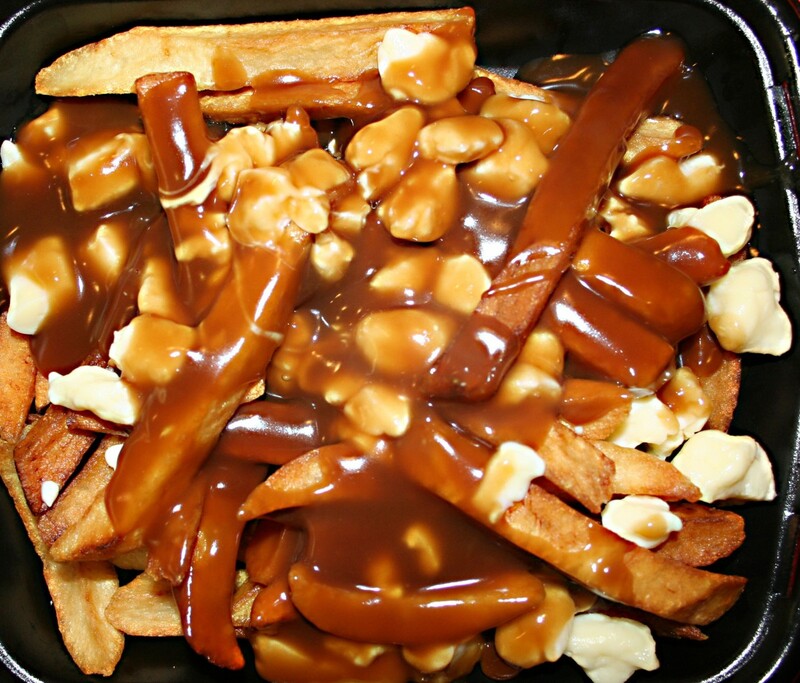 Once they turn golden brown, take out with a slotted spoon. Place them on an absorbent paper towel. Repeat the same procedure for frying all the patties. 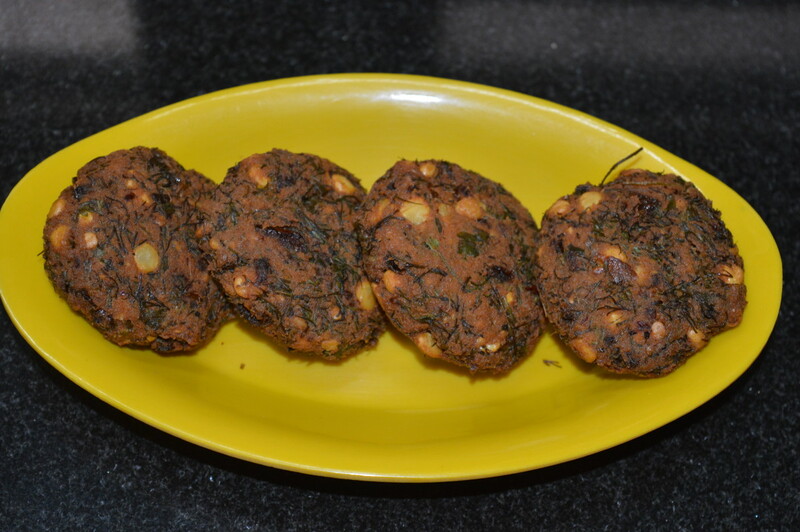 Split bengal gram fritters or dal vada (ambode) is ready to eat. Serve them with a cup of hot tea or coffee. They are very delicious, and spicy snacks. You can even eat them just as it is! 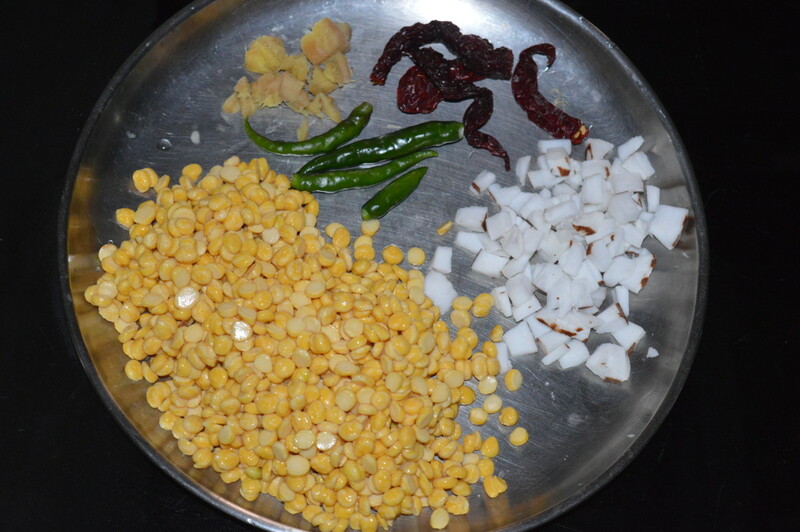 Step two: Take ground mix, rice flour, chopped onions,finely chopped dill leaves, coriander leaves, curry leaves, hing, hot oil, and salt. Mix well to make a firm dough. Step three: Take lemon size dough, and make round patties. Keep ready all the patties. Step four: Fry them in hot oil in batches. Frying takes longer time. It has to become crispy from inside. Each batch takes about 6-7 minutes for frying. 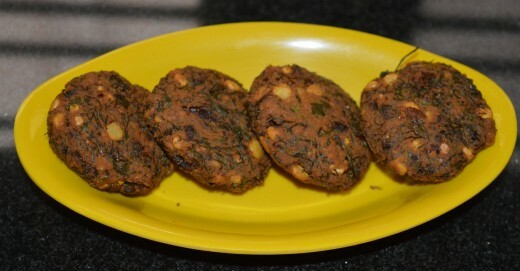 Vada takes dark green color due to the leafy greens. 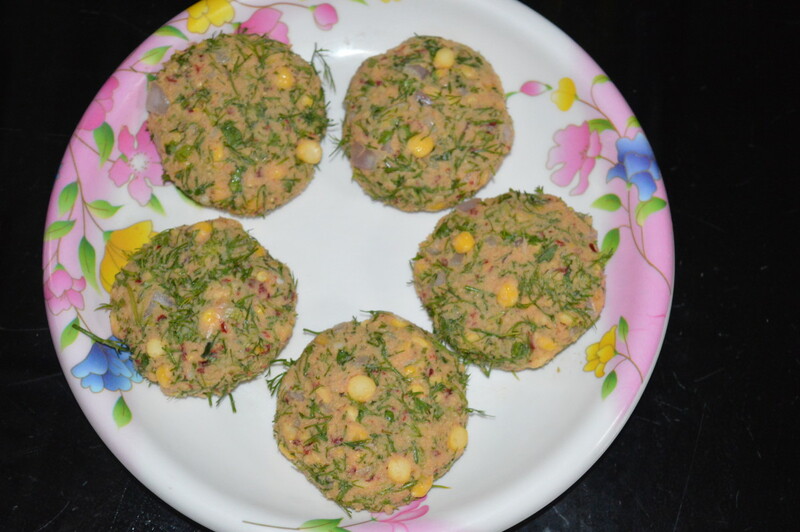 Bengal gram fritters or dal vada with less leafy greens.